As mentioned on the previous page, closed-end funds rarely trade at prices equal to their NAVs. It’s not uncommon for one CEF to trade for 15% less than its NAV while another simultaneously trades for 20% more than its NAV. 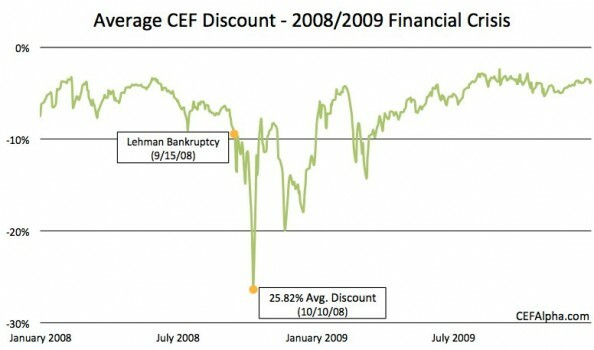 This curious phenomenon begs the question: are CEF investors nuts? Why would two willing parties transact at a price different than what something is actually worth, especially when what it’s worth is public knowledge? The answer to that simple question is decidedly complicated. Many theories have been published in academic finance journals that aim to explain why CEFs trade at premiums and discounts. The mystery has yet to be solved completely. Here at CEF Alpha, we have no idea why anyone (who is sane) would buy a CEF for more than NAV. That is nuts! On the other hand, it is easier to see how investors can rationalize trading CEFs at a discount to NAV. In order to understand what’s going on here, it’s important to understand some basics about CEF premiums and discounts. Generally speaking, most CEFs trade at a discount to NAV. A fund’s discount to NAV changes with each transaction and can be pretty volatile — one month a fund might trade right at NAV and the next month it might be worth only 85% of NAV. As a rule of thumb, funds’ discounts tend to grow during periods of market distress when retail investors rush to sell off investments and shrink during more stable market periods when the same investors shovel cash into the market. The same is true on a sector level: if REITs are performing poorly, odds are that discounts on CEFs that hold REITs will be larger than normal. During the stress of the 2008-2009 financial crisis, for example, many funds traded at discounts of 30% or more before moving closer to their NAVs as things began to calm down. 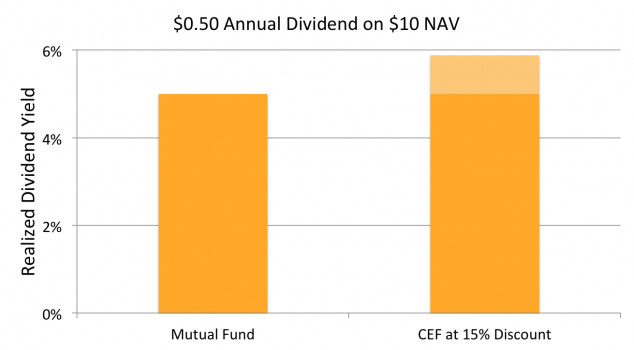 It may be possible to rationalize the fact that CEFs frequently trade at a discount to NAV by considering one of the core concepts of financial theory: the relationship between risk and reward. When you buy a mutual fund or ETF, you don’t need to worry much about whether you will be able to sell your shares in the future for NAV… you just have to worry about whether NAV will go up. When you buy a CEF, you take on the risk that when you finally want to trade your shares back in for cash, you may not be able to sell your shares for NAV or anywhere near NAV for that matter. You are thus compensated for taking on the extra risk of a CEF’s potentially volatile discount by being able to purchase shares for less than NAV. All else being equal relative to an ETF or mutual fund, buying a CEF at a discount gives the investor a fatter dividend yield, which allows for faster compounding and a higher expected return. Consider a mutual fund and a CEF that each have a NAV of $10 and hold identical stocks that throw off $0.50 per share per year in income. The mutual fund investor will realize a yield of $0.50 ÷ $10 = 5%. If shares of the CEF trade at a discount of, say, 15% ($8.50 per share), then the CEF investor will realize a yield of $0.50 ÷ $8.50 = 5.88%.